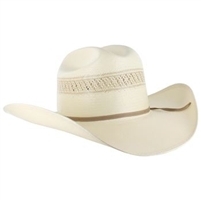 The Skyline 6X Felt Hat is an example of the fine quality and craftsmanship that you know in the name Stetson. The X's in the hat are used to represent the quality, so this 100% pure fur felt hat is up there with the best. The 4" brim will come to you with a profile that is molded in the factory, but it has the ability to be shaped to your preference. 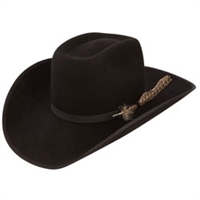 Completed with a felt band that features a small buckle adorning the Stetson logo, this hat will have you in high-quality, classic Western styling. With a Stetson hat, you've found a hat for a lifetime. 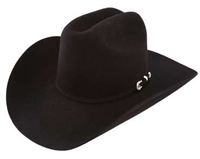 This Charlie 1 Horse Studly Black Felt Cowboy Hat features underbrim cutouts covered in silver pyramid studs and nailheads with bound edge and matching band which makes any cowgirl look up-to-date and very modern. 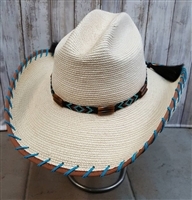 This is a stellar example of Charlie 1 Horse construction with 4X Wool, a 4" Cattleman crown, a 4" Brim, and silver metallic studded band and underside, and of course, the Charlie 1 Horse fire branded crown. Mink felt sloped-crown hat with hair on calf skin cutouts sewn beneath the brim, embellished with a star and nailheads, bound edge and matching band. Only the best for daily use or a hot night out. The Lariat 3X fur blend hat is a part of the 3X Beaver Collection by Stetson and it is a great example of the quality that you have come to know from this brand. This hat features a 4 5/8" brim that is able to be shaped to your preference and a 4" crown. The hat band is a felt band with a silver buckle set. 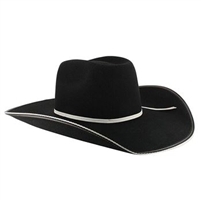 The Holt B wool cowboy hat is part of the Tuff Hedeman collection by Resistol. 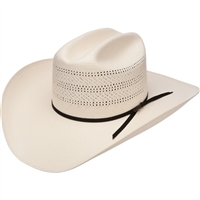 This is a tough hat that boasts a 4" bound edge brim and a 4 1/4" bullrider crown with a profile 79. This hat also comes with a self matching grosgrain ribbon hat band and includes a feather for an accent. This hat is a great choice for the colder months when it is time to put away the straw hats and start to get warm. Order yours today! Bound in coffee, laced in turquoise suede with a beaded hatband in matching colors. 4" brim Guatemalan standard palm. Dressing to keep your sidearm close has never been easier. This black ladies bonded jacket with water-resistant finish and windproof cuffs protects you from the elements while secretly storing your weapon. Designed with two concealed carry pockets and a Velcro-backed holster, two zippered front pockets to stash personal items and CINCH brand logo embroidery.